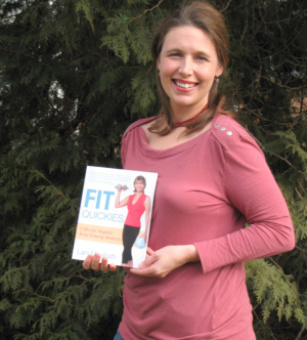 Since reading the Fit Quickies 5-Minute Targeted Body-Shaping Workouts just a few short weeks ago, I have gone from a tight size 8 down to a loose size 6 pant size. But what’s even more important than that is that I’ve changed for the better ten-fold on the inside compared to the outside! I started my plant-based journey last August and frankly I was “lost in the sauce” concerning nutrition. This book, as well as Lani’s Plant-Based Blueprint opened my eyes to how truly easy and beneficial this lifestyle can be. This really hit home with me. I had an ahaaaa moment when I found Lani and her site. The Plant-Based Blueprint drove it home. And now, reading Fit Quickies drove it home even more that this doesn’t have to be complicated. Amazing! Lani said the quote was worth framing for your kitchen, and I plan to do just that! I also really connected with her writings about meditation. She states that, “It diffuses stress and brings calm, explores the mind-body relationship, expands your sense of who you are beyond your fears and self-judgment and awakens your capacity for insight and wisdom.” I love how she’s given us a guideline to get started. This girl is on a new flight plan! Fit Quickies also shone a light on some completely false ideas that I had about food, such as thinking that a richer meal that’s higher in fat would be more satisfying, and that “Intuitive Eating” was good for me. Brilliant! She says, “Your choices become your habits. Your habits become your lifestyle. Your lifestyle becomes your destiny.” Choices, habits, lifestyle, destiny is my new mantra indeed! The 14 Fit Quickies are amazing. Each Fit Quickie Exercise is explained in detail and illustrated with pictures, which really helps. Every Fit Quickie is broken down into The Problem, The Facts, The Fit Quickie Fix, How to Do It, How to Anchor your body, How to Isolate the muscles, Repetitions, Stretch, Common Errors and Tips and Modifications. The modifications she offers make these exercises doable at any fitness level. To me, tackling a new Fit Quickie per day, gave me the freedom to browse through the Fit Quickies, but then read ahead. This allowed me to read each Fit Quickie more in-depth on the day I actually did them. Each Fit Quickie holds such a nugget of wisdom, that at least for me, my brain needs to soak up the material, accomplish the skill, and then reflect on it for a while before moving on to the next. This book, as well as Lani’s Plant Based Blueprint (which I had spiral bound at Staples for $4) are my go-to books where I find not only information, but inspiration! Thank you Lani for changing my life!